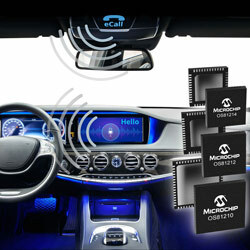 Microchip has announced what is claimed to be the industry’s most efficient automotive infotainment networking solution. The solution supports all data types, including video, audio, control and Ethernet, over a single cable. Intelligent Network Interface Controller networking (INICnet) technology is a synchronous, scalable solution that importantly simplifies building audio and infotainment systems, providing seamless implementation in vehicles with Ethernet-oriented system architectures. As audio is a key infotainment feature in vehicles, INICnet technology offers full flexibility through supporting a mixture of digital audio formats with multiple sources and sinks. The technology also offers high-speed packet-data communications with support for file transfers, OTA software updates and system diagnostics via standard Ethernet frames. Thus, the technology supports seamless integration of IP-based system management and data communications, as well as very efficient transport of stream data. The technology does not need the development and licensing of further protocols or software stacks, lessening development costs, effort and time.